I clearly remember the first alert 6-52 participated in. It was a disaster to put it mildly! I believe all the batteries had some major glitches that were both funny and serious as it was occurring. This first alert required all the batteries to go to their assembly areas -- getting there was the problem, and proved that prior route ground recon had not been properly accomplished. In HHB the Bn S-2 M109 shop van was enroute to its designated location and failed to take into account a low archway overpass, and ripped the top half of the van off the frame. A Btry came down off the hill and had quite a time with the hill and the right turn that had to be made at the bottom. Two trucks were jack-knifed that kept most of the battery sitting on the road going down the hill, blocking traffic for vehicles trying to go up the hill! D Btry, up on top of that knob in Wertheim wrecked 2 vehicles while trying to make the drive down, again traffic blocked in both directions. B Btry, I believe, got tangled up with a 280mm (Atomic Cannon), that was also stationed in Bamberg; they both wanted the same spot on the ground: the 280 outfit won -- because Bravo was in the wrong location! Can't recall what happened with C Btry. A USAREUR alert on Christmas Eve, 1961. As I recall this got called around 2300. I think half the Bn was drunk and the other half couldn't be located. That whole affair looked like a chapter off of M*A*S*H. The Bn wrecker driver pulled out of Emery gate and took the guard shack with him, luckily the guard wasn't in it. The stories about this event would take hours to explain, so won't get into it all. An explanation about alerts: Alerts in USAREUR back in the 50s & 60s were a big deal. Every month there was an alert. Date and time of alerts were kept secret and could happen at anytime: middle of the night, weekends, holidays, etc. -- nothing was exempt! Again, all due to cold war and Soviet threat. Most of the alerts required that all TOE property be loaded on respective vehicles, everything to go to war. Loading plans were hot as was the ability to load up fast & be ready to move within 2 hours. The Bn spent countless hours devising and revising load plans and developing techniques to load equipment. We also had a curfew to contend with. At 2400 hours daily all military personnel had to be off the street. If married, had to be in your quarters. If living in the billets, had to be in your bed. Between 2400-0100 Every Day bed check was conducted by CQs & Bn staff duty officer/NCO. Not in your bed--Art 15, no questions asked!! In addition to curfew we had a dress code. In 1961 and 1962 it was coat and tie to get out the gate on pass. That was relaxed in late 62 or in 63 to jacket without tie. Yes, had to have a pass to get out the gate. The 1SG kept the pass box in the orderly room and he controlled who got a pass & who didn't. If you went in at night to get your pass & it wasn't there, you knew the 1SG had a problem with you. Pass privilege was just that, a privilege. Sneak out the gate without a pass & get caught -- Article 15, no questions asked! Passes were an Army thing back then, not just Army Europe, but more tightly controlled over there. 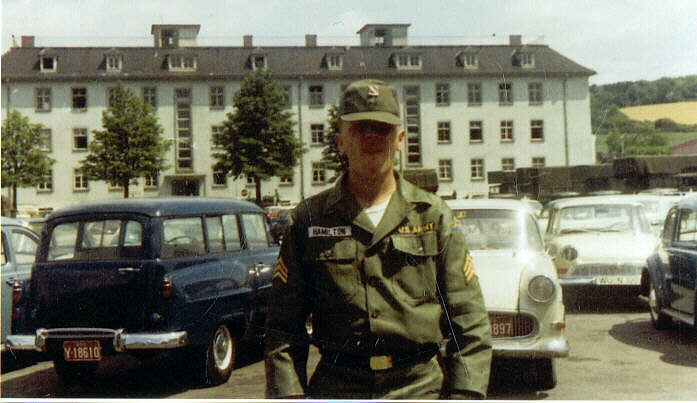 6-52 arrived in Germany just a short 16 years after WWII. Not long considering the entire country had to be rebuilt. War damage was evident in most larger cities then. Buildings still partially destroyed, buildings and other structures with bullet and shell holes, etc. Würzburg was 95% destroyed during the war (believe that is correct figure). Have to say though, great strides had been made by 1961, by the Germans in rebuilding their country. There was still a lot of unexploded ordnance being found at that time. In Giebelstadt (where C Btry was at), the airfield up there looked liked a bunch of gophers had taken over. There were holes being dug all over that airfield, digging up unexploded bombs and other ordnance. The underground basement area of one hangar was blocked off and the story was that it was rigged with explosives and had not been disarmed. Many of the senior NCOs in 6-52 at the time were WWII vets, and two of them happened to be with the outfits that liberated Würzburg in 1945. They had some interesting stories. In the early 60s one of the main modes of transportation for the Germans was bicycles. Everybody rode bicycles. The cars the Germans did have at the time were mostly VW beetles, and an Opel now & then. Back then the GIs were driving big fancy cars and the Germans had the old worn out stuff. I think that is reversed today!! In order for an American soldier to own a POV, one had to be in the paygrade of E5 or above. E4 and below were not authorized to own a car. The exception was an E4 or below that was married and had family in the command. That was practically unheard of because very, very few lower ranking enlisted personnel were married, and if they were, their families were sure not in the command. At that time there were no shuttle busses or the like, so it was walk or taxi to where you wanted to go. We got a lot of exercise back then. The DM rate to the dollar the was 4DM to the dollar and in some places 4.20DM to the dollar. Beer was 50pf for 1/2ltr. Soap and cigarettes were great commodities on the black market. Those two things could get you just about anything! The 7th Army IG and CMI inspections were probably the worst feared of just about anything that commanders had to face. It was no fun for the troops either! These inspections happened on an unannounced basis and to fail one; well you just didn't want that to happen. These inspections usually occurred once a year and as the window approached, Bn level commanders and higher would put "recon" people out on major roads into town, to warn of spotting the 7th Army IG or CMI bus. What 15-20 minutes advanced notice would help, I never did figure out. Not making this up -- true story. The IG inspection usually consisted of all the Bn staff sections being inspected as well as the billets with open wall & footlockers and TA-50 layout. The troops would have to standby in the billets and stand in an in-ranks inspection, all in Class A uniform. Of course, during all of this the officers and senior NCOs would be going crazy while trying to make sure all went well. If 7th Army went away not feeling good about what they observed, there would be hell to pay! As I recall, the battalion did well in all the four years that I was there. Always some glitches, but overall we did okay. The CMI was an inspection of all vehicles, launchers, radars, weapons, all equipment, and associated records. Usually lasted 2-3 days in order for the inspection team to look at everything. The "backstage" shuffling by the Bn during this process was a sight to see. It came down to the point, in many cases, where it was practically "on hands and knees" to get through the inspection. Regardless of how well prepared you were, "Murphy's Law" always popped-up. Great experience, but not a lot of fun!